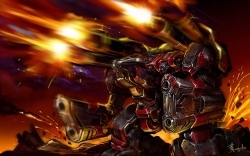 Terran gathers, And now my mech begins, It shall not end until my death, I shall take no stim. Hold no CS, father no Marines, I shall wear no crowns and win no glory, I shall live and die at my factory. I am the Hellbat in the darkness, I am the Cyclone on the walls, I am the Thor that guards the realms of men I pledge my life in honor to the Mech Gods, For this night, and all the nights to come.